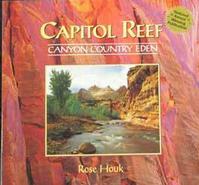 Author Rose Houk has written six poignant essays that express a deep, but unpretentious appreciation of Capitol Reef. She is intimately acquainted with this inspiring and uncompromising land. The accompanying images represent the work of landscape photographers from Utah and throughout the West. Their evocative photographs offer us more than a gallery of pretty pictures; they reveal the unique character and unexpected diversity of Capitol Reef.